Although she’s too young to have heard Dr. King speak in person, Hall grew up listening to her mother – Carrie Mae Golden – tell stories of Dr. King and took to heart Golden’s deepest regret. Her mother wanted to hear Dr. King’s “Mountaintop” speech the night before he died, but her own mother said it was too dangerous, and she wasn’t allowed to go. Although based on her mother, the character of Camae is more than that. She’s the antithesis of King, and she provides an ideological foil for King to debate. At times, she also brings out some of the more commonplace aspects of his personality. Simply set in room 306 of the Lorraine Motel in Memphis, all the details are there in Eric Sinkkonen’s scenic design. The furnishings match the period with a pair of double beds, a desk and bureau, and even a bathroom upstage right. We see the famed balcony through the window upstage center. The rotary phone is appropriate, and there’s a nice early scene when King starts to phone home, thinks better of it, and then unscrews the mouthpiece to check for bugs. Even the details are right as Roberts uses the same number on the rotary dial each time he calls home. Gregory Robinson’s sound design adds tremendous impact from the thunderous booms following lighting designer Jason H. Thompson’s lightning strikes. Additionally, Robinson features his song, “Hold On”, with trumpet soloist Steffan Kuehn’s soulful tones opening the show. Director Anthony J. Haney initially feared what he would find in Hall’s play, but upon reading it, he gained a deeper respect for his hero Dr. King. Casting this production presented a unique challenge. This is a two-person play, each performer commanding the stage at various times, and Haney had to strike the right balance. He needed two actors who could breathe life into these bigger than life characters, not only Dr. King, whose historic oration captivated audiences during his short lifetime, but also Camae, who has to stand up to him, mock him, imitate him, encourage him, and adore him. Haney struck gold with Adrian Roberts as Dr. King and Simone Missick as Camae. The two have tremendous stage chemistry and fully inhabit their characters. They keep the audience members on the edge of their seats, hanging on every word, at times laughing out loud while at other times, sitting back in shock and awe. Roberts delivers pieces of King’s sermons with such conviction, the audience is tempted to collectively shout a hearty “A-MEN” as one voice in several places (and did on opening night). He also flirts with Camae, not in a lascivious fashion but rather gently. Missick is the perfect “mouthy” maid, with a smart comeback to every challenge King offers. Camae’s language would make a sailor blush at times, and it’s very funny when she goes on a tear and then stops herself, her character embarrassed that she spoke in such a fashion in front of a preacher and apologizes for her language. Missick trips on a few diatribes ever-so-slightly, but she never breaks character and soldiers on in grand style. The character of Camae is complex. She has great admiration for King, but she doesn’t fully embrace his nonviolent methodology siding instead with the teachings of Malcolm X. Camae tells King that he would have liked Malcolm X. She says he was a good man who “didn’t drink, smoke, cuss, or cheat on his wife.” Camae is sly when she points this out as King has been drinking, smoking like a chimney, swearing in response to her emotional tirades, and he’s strayed, and Missick captures the perfect knowing expression in her delivery, letting on that she’s on to him. Both Roberts and Missick have a penchant for delivering sermons with King-like composure and presence. Their performances are convincing, and while nobody knows for sure how the real events of 3 April 1968 played out in that motel room, the events that King and Camae discuss are historical record. 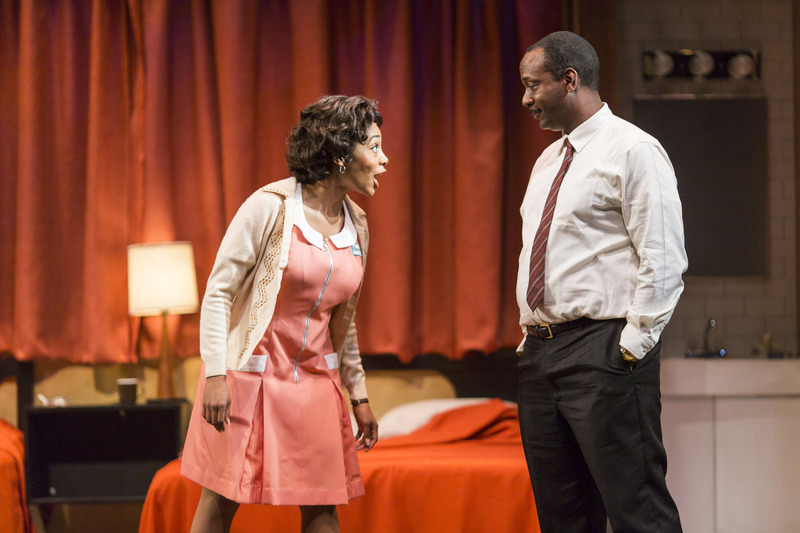 The Mountaintop is not only compelling theatre, it’s quite educational. There is some strong language at times, so the play isn’t appropriate for young children. The show is performed in a single 90-minute act, but the time flies as the story soars to great heights. When: Continues through 7 April 2013; the 4 April performance will include a special tribute to Dr. King marking the 45th anniversary of his assassination. See www.theatreworks.org/shows/1213-season/themountaintop or call (650)463-1960 for more information or to order tickets. The sharing option will tweet your blog updates on Twitter. I haven’t looked into going the other direction.